Times have changed, haven’t they? Back in the day you would wake up from an alarm clock ringing by the bedside, go out and meet friends, basically do much of today’s work that we take for granted manually. Well, times have changed. You have smartphones for everything now. Wasn’t it so much better in the past? Ummmm … no, it wasn’t! ​And that’s because, with today’s technology, you can go do everything at the press of a screen. That includes finding fish. What once needed an unusual, unique skill and visual dexterity has now been reduced to a measly matter of putting a device in water! AND WE LOVE IT! Today we will help you go through the best fish finder under 100. We start off this list with the ReelSonar (also called iBobber), a wireless Bluetooth wireless fish finder. At first glance, you might mistake it for a Pokémon because it truly looks like one! It looks like a flattened ball with three, teeny tiny legs underneath. The top portion is white, while the bottom is a bright red. Now, what makes this fish finder unique is that it shows you an animated vision of what is going on in the water, all on your smartphone! As the name suggests it uses Bluetooth functionality to connect the device to the app. What this obviously means is that it is portable. You could put it anywhere you want to, as long as it is within Bluetooth connectivity reach, and you will get data constantly. To maintain this, the device has a rechargeable battery. ReelSonar, also as the name gives away, can be placed into the water using a reel. This is because it is extremely light at 1.6 oz., which is why you can pretty much move it around like a large piece of bait! Once you put it in the middle of the water, it uses its unique, patented fish-finding sonar to get to work. It is so good that it can tell you accurately what is going on as deep as 135’ underwater! It gets even better though. It gives you details that are extremely precise. If it tells you there is a blue colored fish exactly 80’ deep in 72.5 Degrees Fahrenheit temperature, you can bet your life it is true! The app UI is amazing too! It not only shows location, but it also distinguishes fishes using color-codes for fish of different sizes. Using various graphic elements, it makes it easy to place everything in the water quite accurately so that you can plan your catch seamlessly. ​Overall, it is a solid fish finder that is great value for money. ​​​​​​​​Able to perform in various scenarios. ​​​​​​​​​Lightweight aids in moving and reeling. ​​​​​​​​​​Poor battery life for the task it does. Next on this list is the Venterior VT-FF001. This is another portable fish finder, but it differs greatly from the first. Let’s get the main parts out of the way, it has two different gadgets, a sensor, and a controller. The controller is basically a remote with a screen that is given a dark-grey fill with a yellow cover, while the sensor is a piece of black cylinder. The two are attached via a cable that is 25 feet long. The uniqueness of this baby is brought about by the waterproof sensor, which is a transducer that sends out one ray of signal that is spread out 45 degrees. It goes as deep as almost 330 feet, which is, needless to say, very deep! Once you factor in that it can be put into the water, that is quite impressive. In addition, this transducer acts as a sonar motion detector. What this means is that it can only detect fish that moves. You won’t find anything that sleeps underwater, that’s for sure. But anything else is an easy catch! You can also set a varying sensitivity level so that it detects the size of fish that you want to. You can overlook smaller fish if you want. One disappointing aspect, though, is the display. It looks quite old-fashioned, sort of like the display old-school games used to have. If you hand it to a little kid, he might mistake it for a really old video-game! Of course, it does show all the necessary information, such as depth, battery level, etc. In essence, it just gets the job done. Nothing too fancy. It is also portable, which is thanks to the fact that the control unit-transducer are battery-powered. It is fairly obvious though, isn’t it? I mean, how else would you be able to use it? What makes this ‘good enough’ is that you could pretty much hang it from the side of anything and it will do the trick……. …. well almost anything. If you are on a boat, it can’t reach 5mph or over. Because, you know, it detects moving fish. How would it work if it is moving itself? But apart from a few hiccups here and there, this does do a good job. The Lucky FFW-718 is quite a simple and typical piece of fish-finding technology. It comes with a typical receiver and a brightly-lit, yellow sensor. All you do is drop the sensor (which, by the way, somewhat resembles a cute rubber ducky!) into the water and it floats. Underneath is where the signal is sent and information is obtained, which is transmitted back to the device. The receiver is similar to the old Gameboy design, with the screen in the middle taking up a lot of the space. On the lower side of the face are the buttons, and a red LED light on top to signal fish detection. The display interface looks like those old-school games too, but it shows all the information you will need, including the depth each individual fish is in. It also comes with fish size readings, backlighting, and you also get multiple language options. And of course, you get the usual sensitivity settings, fish and depth alarms, chart speed settings, the works. The sensor is shaped like the base of a duck but has a covered hole containing the sensor and a protruding piece of cylindrical plastic where the antenna presumably stays. The sensor has exceptional range, both in terms of depth and distance. It can detect as deep as 135 ft. underwater, and can send back information almost 400 ft. away. It also has a really wide area coverage, which is done by a 90 degrees beam angle from the sensor bottom. To complement the functionality is an equally impressive battery. The sensor can go up to 550 hours of use without needing to be recharged. Unless you decide to go on a month-long trip away from any source of power, you really don’t need all that battery! Best of all, since the sensor is quite small and light, you can simply throw it into the water using a reel. You get all the works with this, and trust us when we say it, it deserves a shot! ​​​​​​​​​​A wide variety of accurate readings. This fish finder is probably the closest you will get to a fish finder that resembles a gaming device! If you didn’t know better, you would definitely believe anyone that said it was indeed a gaming device, because it has the exact design of one. The upper portion of the receiver comprises the screen, which is surrounded by red portions. The lower portion is entirely black with several buttons, including directional buttons. This fishfinder uses an external signal source for fish detection. You will see it is familiar, the typical black cylinder transducer detector. You should know how it works by now. This being the Virtuview Icon display, it basically shows everything in the water as icons. You have depth readings on the top-left, temperature readings on the top-right, fish depth readings on the right, and several others on the left showing the present status of the fish finder. Again, excuse the horrendous old-school display because, as you can see, it is becoming a recurring theme as we go through the list. But it gets the work done, so why complain right? RIGHT? Anyhow…… there are 3 models of this baby that are available based on your skill level in using fish finders. For the newbies, they have the HawkEye FishTrax 1. It has the basic LCD display with icon visuals, tweakable sensitivity, an alarm, and backlighting. Most important of all, it has a 14-degree beam angle which, in laymen terms, means you have limited underwater area coverage. The Intermediate FishTrax 1x just ups it by having dual signal, auto-switching, twice as many sensitivity levels, many choices of depth and auto-zoom. In addition, you get a choice of 14 or 26 degrees of beam angle as well as depth identification of fish. ​The Advanced version, the FishTrax 1c, differs by having a colored display and has 3 modes: Fish Finding, Data, and Ice-Mode Digital Flasher. Long story short you use it for whatever you need. It also automates many of the previously manual functions. That is why it is the Advanced! ​​​​​​​​​​Multiple versions to meet your skill-level. ​​​​​​​​​​​​Small display for the area coverage being shown. The Lucky Portable Fish Finder is next on the list. Now, this is quite a bit different. At first glance, the receiver-display gadget looks much more polished, with a colorful LCD screen. It is uniquely designed too, with a color combination of reddish-orange and black plastic on the exterior and interior surrounding the colored frame. There are buttons right underneath the screen, and with a black border surrounding the screen, this looks quite a bit better than many of the others on this list. It also uses a transducer for fish detection. The usual. It is a black cylinder that you put in water, it detects fish for you. Of course, it is wired to the receiver but is a decent 26 feet in length. The transducer has a detection angle of 45 degrees and can probe as far as 328 feet in depth. All you do is stick it to the edge of whatever water vessel you are on and it will get to work. The receiver and display are quite detailed. On the top-left, you will get details regarding water temperature, water depth, and signal strength, while you have a battery indicator on the top right. You can zoom on it too. Fish are shown colored, with their corresponding depth reading on top of each fish. You can also see the bottom of the sea to great precision. Talk about pulling out all the rabbits out of the hat, huh? Given the right equipment, you could also take this out for use for quite a while. The fish finder is rechargeable and equipped with a USB port for charging. A full charge can mean up to 5 hours of constant use, and once that runs out you can recharge it again. Neat stuff! Like most others, you can give settings for identifying particular types of fish, and it comes equipped with a fish and depth alarm to go with it. Overall, this is a handy piece of fish-finding tech which you will like. ​​​​​​​​​​​The rechargeable battery means you have almost unlimited usage potential. ​​​​​​​​​​​​​Fish size indication limited to small, big and large. Next on this list is the Venterior Portable Fish Finder. This also comes with the usual transducer detection system, but most of the magic happens on the fish finder itself. It is quite a big gadget with a yellow body and black rubber on both sides. The top has a cable sticking out which connects to……... you guessed it, the transducer! Getting real tired of reading about it, aren’t you? Well, get used to it! All jokes aside, the transducer can detect fish as deep as 100m, from the sonar down. If you are on a still boat, for example, you could get it quite deep if you put it directly downwards, in part due to the 25 feet cable and the float being removable. The sensor has a 45-degree beam angle, which is standard for Venterior fish finders. The screen is, again, a bit of a let-down for today’s technology, but given the price point, you really can’t complain! It uses an outdated gaming console-like LCD display with a single-colored screen. The icons are dark, and the screen shows data for depth, battery level, alarm status, and a few other stuff. One neat part though is that it shows what the waterbed is made of, which is a nice touch for something that looks old! Wait, it gets better. It also has a power saving mode and a backlight mode which you can use to see in the dark. On top of that, you get the choice of 5 different sensitivities to choose from to get the right fish just for you! ​You also get a ton of options regarding how you want to use it too. You could keep it steady on a flat dock, attach it to the edge of a boat or kayak, you could even keep it on the palm of your hands when searching for fish! All in all, what you are getting is a fish finder that does the job well. Even though data is limited, it does give you enough to plan a catch. ​​​​​​​​​​​​​​Difficulties in finding fish in muddy water. This is another good fishfinder if you are working on a budget. The Erchang Portable Fish Finder is similar to most low-end fish finders, both in design and feel. It is a typical yellow-body gadget with an outdated display and transducer sensor for finding fish. The fish finder has the usual body with buttons towards the bottom and the screen taking up half of the entire thing. It also has rubber sides for easier grip. The transducer is also typically black and cylindrical, capable of finding fish between 2 ft. to 328 ft. in depth. The two are joined by a cable protruding from the top of the fish finder. The screen shows all the basic information, except for the water temperature. Apart from having a depth scale on the right, the icons show both the fish depth and size, the modes that are activated, level of sensitivity, power level, the works! Based on this, you can see various fish sizes in various depths, and thanks to night vision you can do so even during odd times. And the setup means that you can essentially put it anywhere from boats to the shore or even a pier. By tinkering with the sensitivity you can also make it work out in icy regions (yes, it can find fish in ice!) for the Arctic catch! The screen is an Anti-UV LCD screen with LED backlighting (this is where the night vision comes in). It is also capable of showing what the ocean floor is made of, using cute tiny symbols! The sensor has a 45-degree beam angle as well and uses unique sonar tech to identify 3 different fish sizes. It isn’t much, but it is better than not knowing the size at all. You can see it on the display as different sizes of the fish icon indicating small, medium and large. Overall, this is a great budget fish finder to have, that will give you almost all the information that you need. Which, let’s face it, is good enough for you if you are looking for a budget fish finder! ​​​​​​​​​​​​​​Can be used on a variety of circumstances. Now, this is a completely different kind of fish finder compared to the rest on the list. Unlike the rest, this fish finder is actually an underwater camera of sorts. You literally see what is going on down there thanks to a waterproof camera that is attached to the fish finder. The main fish finder itself has a 4.3-inch TFT monitor with Color CCD and the default version has a color range of 15M. On the immediate border of the screen is a white plastic that surrounds it entirely. This is framed by a grayish plastic body which forms the hull of the device. On the bottom are several buttons for the various functions, flanked by a set of speakers. This looks like one of those old medical gadgets! The camera is connected to the finder via a cord which connects to a port on the side of the finder. The length of the cord isn’t the longest, but it should do. You don’t need it to go down too deep since the camera will cover a large distance anyway. The camera, of course, has a viewing angle of 130 degrees. This is achieved by fish eye view-designed lens that covers a much larger part of the frame. Needless to say, too, is that the camera is waterproof, with the exterior sealed tight to prevent water seeping into the cable or in through the edge of the lens. The battery on the thing is rechargeable. Of course, you can use it for 6-7 hours at a stretch with a single full charge, but being able to recharge it just makes it all the more long-lasting. ​Overall, not only does this fish finder do quite a distinctive job in fish detection, it is something you will be more comfortable with due to your undoubted experience in using cameras. Say cheese, fishy! ​​​​​​​​​​​​​​Shows actual events with extreme accuracy. This is another portable and truly wireless fish finder that looks and performs quite well. It is shaped like one of those old handheld gaming consoles with small screens and buttons on the bottom. The screen portion is surrounded by red plastic, while the portion holding the buttons is black. The sensor is wireless and is spherical. It is black in color and has a line around the middle wedged inside which is orange. If you turn the upper portion it opens to reveal a charging port. The display is quite informative. It is colored to the brim, so even the ocean floor has colors of green and red. On the top left, you will find ocean floor depth readings and water temperature readings. The fish themselves have different sized icons to indicate fish sizes. The top right shows the battery levels of both levels, and the right border shows a depth scale to compare depths. The use of icon sizes to show shapes and corresponding depth readings is quite useful. The Sonar sensor can find fish as far as almost 150 feet away while the wireless connection works up to 100m. If you combine these two distances, you can look quite far! There are also several other features, such as the fish alarm, but those are almost commonplace. ​The best part is that the sensor and fish finder are separate and wireless. You can keep the fish finder anywhere you want to while the sensor is underwater doing its thing. It lets you find fish in a variety of circumstances. When it comes to adapt and overcome, this fish finder is up there with the best. The last name on this list, this fish finder is basically as budget as you can get. It has the typical yellow-black color theme. The fish finder has a black frame with yellow all around, while the transducer is black with a yellow float. You get the old-school display with this. The top row houses sensitivity levels, battery status, power saving status, alarm status, depth indicators, and sea bed indicators. You know, the usual stuff. It also cannot find the water temperature though, just like most other low-end fish finders. The transducer has a shorter cable than most, with the cable 7.5m long only. But it does have a 45-degree beam angle, which is alright. It can detect fish up to 100 meters in depth too, so you have a decent area coverage under the sonar’s detection range. It also has backlighting to make it easier to see under direct sunlight and also at night. The key differentiator for this is the fact that it has excelled seabed detection, which is needed under certain circumstances. For the price you pay for this fish finder, it does what you need to make your big catch easier. ​Plus, you can use it in a plethora of scenarios, starting from on fishing boats to the seashores. All you do is mount it and submerge the transducer. ​​​​​​​​​​​​​​​​Good accuracy while not moving. There are several things that you should look at when buying the best fish finder under 100. This seems to be a no-brainer since all the ones in this list have some form of portability. Either the receiver is portable, or the entire setup is wireless. Regardless, having a portable fish finder makes it easier to move around and take with you, especially when on a boat in rough waters. It is also necessary to know what data the fish finder shows. Most fish finders will show you the fish and their locations, depth readings, battery levels, and the seafloor material. Some of them, however, go the extra mile and provide readings for temperatures and use icons of different shapes to show how big the fish is. Having more data sets to gain insights from is handy and lets you make better choices. The display quality is also important. Who wants an old gaming console-like display right? Colorful, quality displays are the in-thing today. You want to be able to distinguish items using different colors, have popping and pleasing displays that are easy on the eyes while finding the fish that is worthy of your time and effort. There are several aspects of the sensor that you need to take into account. If it is a transducer, the size matters a lot. A larger transducer can cover a larger portion of the water so that you can see more fishes. The beam angle is also important. A larger beam angle will mean that you can see a larger chunk of the sea where the fish reside. The quality also determines whether you can scroll through muddy or murky waters while finding fish. 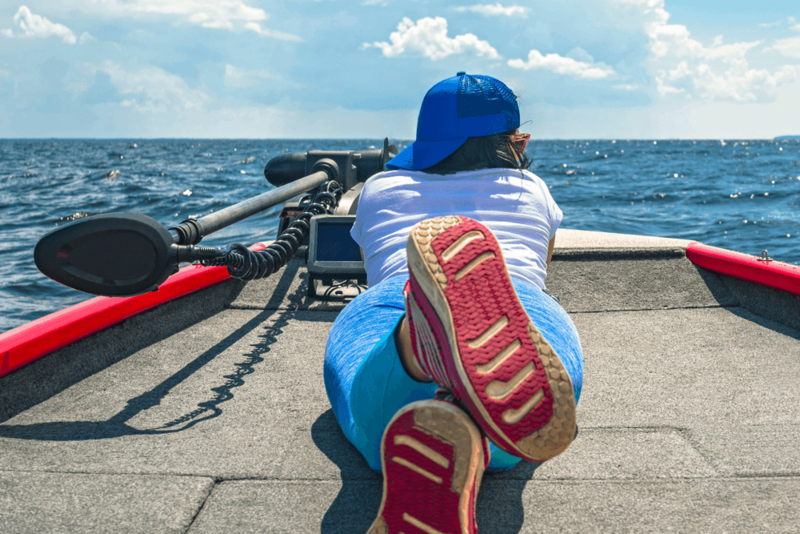 Average fish finder transducers may not be able to detect fish in these scenarios. Heck, some transducers can’t even find fish if your boat is moving too fast! In case of portable fish finders, the battery life matters immensely. Long battery life will make your fishing trips longer and will help you go at it for longer. It gets even better with rechargeable ones because you can carry a much larger, external power source to charge it. ​It is also great if you can use your fish finder in multiple scenarios. You wouldn’t want to go fishing with your fish finder on a kayak, for example, if it cannot detect fish while moving. Of course not! So why not go out and buy one that works well on everything! You can take it on a boat, hang it on a kayak, keep it by the shore as it shows you whatever is happening underwater. Whatever the situation is, you want your fish finder to work. ​Get it? Catch? Because it’s over? No? Well, lame jokes may not be your thing, but at least you do get a lot more about fish finders now. And if you buy one under $100, rest assured you will get your money’s worth. Who buys the extremely expensive ones anyway, right? At this price, you can really good ones, and they will do just fine for you! Now go on sport, an entire world of fishy awaits to be caught!